Does everyone else love YouTube as much as I do? It's especially great for Golden Axe fans. On this page I'll compile all the best YouTube has to offer to Golden Axe fans. From the classics to the current next generation evolution, everything is uploaded and ready for your viewing pleasure. If you find other that need to be added, let me know. Gilius in Super Smash Brothers Melee: Gilius ownz! Original game movie: Good stuff if you miss the original. Speed run: Speed run on a modded Xbox. Tyris: Well, you might be able to explain it better than me. The important thing, Tyris is in it. AMV Lodoss War: Part game, part movie, all cool. Neat Game Trailer Video: Good music and action. Really great music at the end. utunnels on Fire: View all of these videos. All of them. Skeletons from Golden Axe playing soccer: Title says it's all. Goah's magic: They mock, because they do not understand. Death to the DA: Great video of the RODA and the final battle. Super Moves: See most, but not all, of the super moves in The Duel. Gilius on Guitar: Great video showing hard rock, Sega-style. Golden Axe Warrior: If you've never seen it, here's your chance. Sega Tribute: For those of you who really, really miss your Sega Master system. Another Tribute: Same idea. Different song. Golden Axe footage: Great music, terrible graphics. Who needs an arcade: Great retro stuff. Who needs an arcade 2: Just as good. Game footage: Rated T for Teen, so beware. I dream this music at night. Another run: These speed runs are always great to watch. Golden Axe 3 Random Carnage: Fight on, noble warriors! Adder on his throne: You figure out what's going on. Tyris dies: She fights. She dies. Golden Axe 3: Sound effects never sounded so terrible. Golden Axe 3: More death and destruction. Golden Axe 3: Watch other people play Golden Axe, while speaking in a foreign language! Golden Axe 2 Video Review: Pretty interesting, though the narrator totally mispronounces Death Adder. Golden Axe 3 Video Review: More like the above. 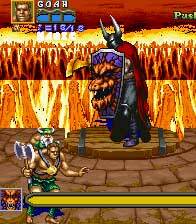 Golden Axe Duel Mode: Nice work here. More here. More here. Game Play Movie: Great music. Terrible game. Golden Axe game play: If you never played it, here's probably your only chance to see it. Golden Axe game play: It's the Amiga. All hail the king of home systems -- well, at one point, anyway. Fan-made game: Started, but apparently never finished. Sega Smash Pack: Plug your ears, it's terrible! Golden Axe: It's on every other system, so I suppose it should be here as well. E3 Trailer: If you didn't see it live, see it here. Well, kinda see it. Another trailer: It's better quality but shorter. Golden Axe Wii: Add another system to the record book. Death Adder Fatalities: To whoever made this: You are the greatest! Contributor Tex sends in these four flash files he put together showing the endings of the different Golden Axe games. So kick back, and relive the magic.